Whether you live close by or far away, it’s sometimes hard to determine if your aging loved needs additional care. It is likely that seniors, who have been independent for a good fifty to sixty years, find that asking for help is difficult. Fortunately, there are some signs that can help tell you that someone needs extra help at home. You just should be vigilant, understanding and, ultimately, approach the subject delicately. Changes in weight – Is it fairly obvious that they’ve either gained or lost significant weight. There may be many reasons why this might be taking place, but it’s often a sign that they need additional care or more medical attention than they have been receiving. Poor hygiene – This might be in the form of hair that isn’t neat when was usually in the past, intense body odor, wearing clothes that haven’t been washed, or showing signs of dirt on their skin. Poor hygiene is often due to financial problems, depression or both. Change in clothes – Did your senior loved one go from wearing jeans to sweatpants all the time? Button down shirts to t-shirts? This could mean that they can no longer use buttons and need help with these types of matters. Frailty – Do they look frail? Diminishing bones and muscle strength is common in older adults. If it looks like they are having a hard time walking or getting out of their chair, they might need some extra help. They may also be at an increased risk of falling. Are they no longer keeping house as they used to? Poor housekeeping can be a sign of early dementia or increased mobility issues. Look for spills that were never cleaned, cobwebs, mold and dust. Too many take out menus and frozen dinners? This could be because they have either lost excitement in eating, do not have the transportation needed to go to the grocery shopping, have difficulty preparing food in the kitchen, or simply is no longer that hungry. Is their house becoming more cluttered than usual? This could be a sign of a neurological issue that should be addressed by their doctor. Plants and animals getting neglected? This could point toward the beginning stages of dementia or a physical ailment that doesn’t allow them to care properly for their pets and plants. Do you live in East or South Wake or Johnston counties? Are you interested in learning about home health care services Raleigh and nearby areas in NC? Consider contacting Always Best Care at (919) 724-4297 to setup a free care consultation. They look forward to chatting with you! Are you planning to move your aging loved one to an Assisted Living Facility? If yes, it is very important for you to find a reputed facility where your seniors can spend their retirement years peacefully. There are many things that you need to look for while visiting an Assisted Living Facility in your region. Here are a few things to get started in making the best decision possible. Make sure that the facility you choose has a safe and comfortable environment for the seniors. The environment should be pleasant and relaxed, with safe surroundings. Look around the neighborhood to see if the setting is convenient for the seniors to live in. A healthy and nutritious diet is important for the seniors overall good health. Check on the food and the quality that the facility offers. In addition, ask about their dining and meals structure. When visiting an Assisted Living community, talk with the staff members. Observe how they behave and treat other residents. Ask them specific questions about the type of issues your loved one faces to see how knowledgeable they are. Read their paperwork carefully to learn about every policy they have related to security, fees, medical services, safety and other areas of concerns you may have. Senior care organizations, like Always Best Care, can help you learn more about Assisted Living Facilities in Raleigh, CO. They are a noted senior care organization that offers reliable Assisted Living referral services. The experienced care coordinators understand the needs of each client and help in finding a suitable senior living option. For more information, call (919) 724-4297. Since 1996, Always Best Care has been North America’s leading senior care giving provider. They take special care in hiring only the best, most compassionate and highly-skilled caregivers to care for their senior clients. These caregivers are dedicated to their jobs and are always licensed, bonded, and insured. Seniors living in the Raleigh area, who are interested in learning the details about home health care in Raleigh NC can contact Always Best Care for a free care consultation. What can you expect during the consultation? An Always Best Care professional care coordinator will visit with you and your family to discuss your needs and budget. A customized care plan will be created for you, and it will be updated as your needs change so that you never have to worry about getting the exact care that you require. Whether you are looking for in-home care or are thinking about transitioning into a senior living environment, Always Best Care can help you with both. If you’re ready to move into an assisted living facility or some other type of senior environment, the care coordinator will assist you with narrowing down your choices (as per your requirements and budget) and also accompany you on tours of each facility. This service is free because ultimately, the facility that is chosen absorbs all of the related costs. Always Best Care has always put their senior clients first and wants only to assist them with their daily activities to help them maintain their independence and improve their overall quality of life. Some of the tasks that the Always Best Care caregivers provide include light housekeeping, escorting to various locations, functions, and events, preparing and serving meals, morning wake up and evening tuck in, and many others. For the past 20 years, Always Best Care has been providing exceptional and compassionate care to seniors all over the United States and Canada. Their goal is to help seniors stay active, connected to their loved ones, and healthy. They accomplish this by hiring only the best caregivers in the industry and going to great lengths to ensure that the right senior caregiver is matched up with the right senior. If you have any questions about home health care in Raleigh NC or Apex home care, you are encouraged to contact the Always Best Care Raleigh location at 919-724-4297 to set up your own free care consultation. They look forward to chatting with you! Polypharmacy. If you’ve never heard of the term, you’re not alone but it’s becoming more and more common as a record number of people reach the age of 65 and over. It refers to when an individual takes more than one medication to treat multiple illnesses or conditions on a daily basis. 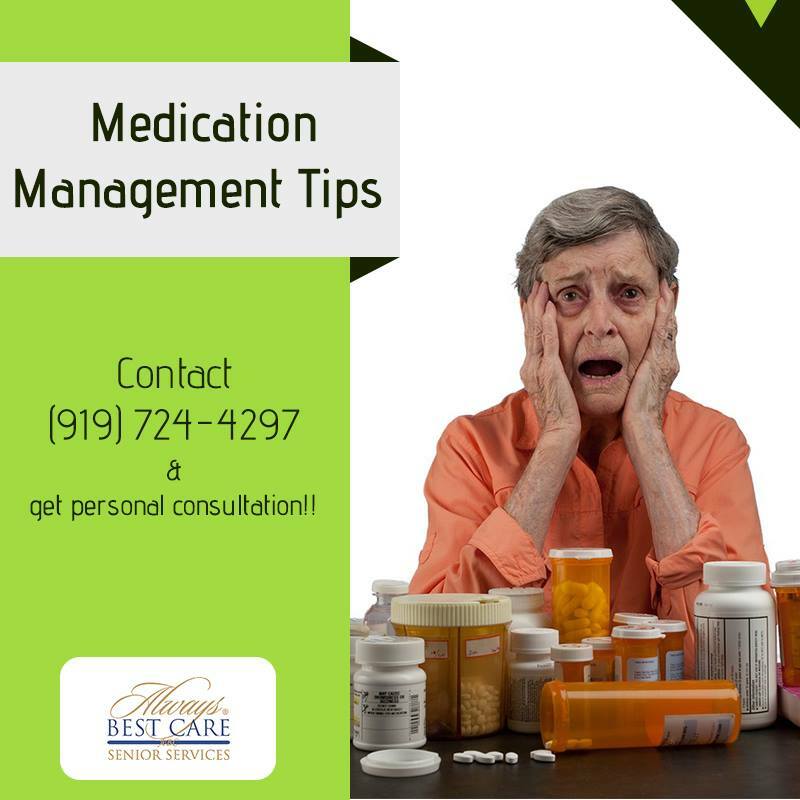 Most seniors take at least five medications every day, and this can result in various problems such as accidental overdose, taking the wrong medication, administering the wrong medication, adverse medication interactions, and more. Create a medications list. Continually update your medication list with every medication you take – even OTC medications and herbal remedies. Take it with you to your doctor’s appointments and specialist appointments. Reason for taking medication should be on label. This will not only help you, but also any caregiver that is helping you. It will also ensure that you aren’t taking too many medications for one issue. Utilize your pharmacist’s knowledge. Your pharmacist is highly knowledgeable; if you have any questions at all about the medications you are taking, make sure to ask them. Utilize the Beers Criteria for Potentially Inappropriate Medication Use in Older Adults. This is a list of medications put together by the American Geriatric Society that seniors should take with caution. Cut back on providers and pharmacists. Ideally, if you can have just one pharmacist, that will help you to keep better track of all of your medications and avert any medication accidents. Ask if the dosage is age-appropriate. The human body changes as it ages, and what might be the right dosage for a 35 year old may not be the right dosage for someone who is 75. Ask your doctor or pharmacist about this. Don’t hesitate to get a second opinion. If you are uncomfortable with taking a prescribed medication for any reason, don’t hesitate to seek out a second opinion on whether or not you should be taking it. Know the medication side effects. Before taking the medication, read up on the side effects, and take note (actually write down) any side effects you might encounter so you can relay them to your doctor. Always Best Care has been providing compassionate and exceptional in-home care giving services to seniors in the United States and Canada for the past 20 years. Seniors living in the Raleigh area, who are interested in finding out more about Apex home care and home care assistance in Raleigh, are encouraged to call the Always Best Care Raleigh location at 919-724-4297 to set up a free consultation. Senior isolation is a serious issue that can result in many detrimental physical and mental problems. It can lead to obesity, cardiovascular disease, dementia, depression, etc. Seniors are at risk of isolation due to many different reasons. Some of these include the death of a spouse, family and friends moving away, chronic illness, lack of transportation, etc. Help them to implement assistive technologies. Things such as hearing aids, walkers or scooters are great ways for seniors to feel less lonely. Although they might, at first, be reluctant to take part (because they believe it makes them look and feel old), once they start utilizing these technologies they will enjoy the freedom they bring. Give them a pet. A couple of things need to be in place before a senior receives a pet. First, does their living environment allow pets? And second, is the senior able to care for a pet (mentally, physically, financially). Caring for a pet, whether it’s a small dog or a fish, will lead to them feeling less isolated and also promote a sense of purpose. Encourage them to go to religious studies or places of worship. Seniors who frequently attend church lead more socialized, less isolated lives. Churches often hold other types of events like bake sales and retreats which also foster socialization. Help them get the transportation they need. Realistically, one single person can’t provide all of the transportation requirements a senior might have, that’s why it’s important to help them figure out the bus route, or make sure the number of a reliable taxi service is readily available. Friends and family members can also help out with transportation. Talk about incontinence. Many seniors suffer from incontinence. It might just be the one thing that is stopping them from joining the world and becoming less isolated. Help them discover how they can address incontinence, whether it’s talking to their doctor about medication, or helping them understand products that are available. Do you live in the Raleigh area? Are you a senior interested in learning about home health in Garner, or Raleigh assisted living? Contact the Always Best Care Raleigh location today at 919-724-4297 to set up a free care consultation. They look forward to talking with you about your many options for a bright future!